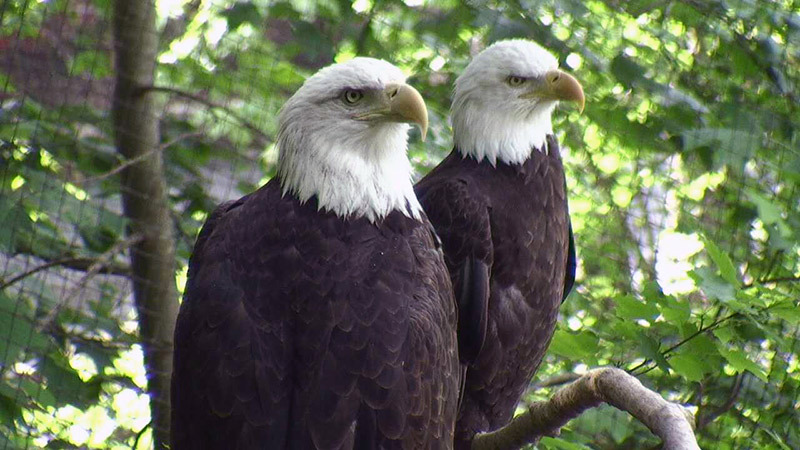 Non-releasable Bald Eagle pair Independence (left) & Franklin, at home on Eagle Mountain Sanctuary at Dollywood. Independence, the female, is much larger than her mate. She also has a dip or curve in her beak, whereas Franklin does not. Why are Franklin and Independence non-releasable? They were both shot in their left wings and can no longer fly. Where are Franklin and Independence from? Independence was less than a year old when she arrived at the AEF in 1994, making her about 23-24 years old as of 2017. Franklin was already fully mature when he arrived at the AEF in 1995, therefore we do not know his age. Independence came to the AEF on May 28, 1994 for treatment and rehabilitation. Franklin came to the AEF on May 23, 1995. His wing tip had to be amputated. Can either of them fly? They can push off from their nest and glide to a lower spot. If they glide to perch on a tree limb after pushing off the nest, they do not try to push off the branch to fly back to the nest. They cannot fly uphill. There is a pole that has been placed from the ground to the top of their nest that they walk up in order to get to the nest. The nest is man-made and is very close to the ground. Franklin can manage a bit better than Independence. How can they be identified from each other? Independence: If you can see her feet, she has both a black band and a copper colored band on left leg. She has a curve in her beak that is easy to see. Her left wing has a white patch, and this wing is droopy due to the injury she sustained when she was shot. Franklin: If you can see his feet, he has a black band on right leg and copper colored on his left. He has an upside-down “V” in front with his white feathers. If you see him from behind, his wing feathers do not cross each other, as he is missing most of his primaries on his left wing. Of course, when perched together on the nest, you can really see the size difference. The female (Independence) is larger than the male (Franklin)! When did they hatch their first egg? In 2002, 2 eggs were laid. One was infertile, but the other hatched on May 9, 2002. How many eaglets have they raised? Indy and Frank have raised 29 eaglets as of 2016 (including a foster eaglet in 2015) who were successfully released into the wild. In 2010, they laid two eggs that were hatched and raised by another eagle pair at AEF, one of which was successfully released into the wild. When do they usually lay eggs? When do their eggs usually hatch? In early May, approximately 35 days from the time they are laid. How many eaglets do they usually have? 1 – 3 per year. How long do the eaglets remain in the nest with their parents? At AEF, eaglets are left int the nest for 6-7 weeks before being transferred to the AEF’s hacking tower. Why are the eaglets removed from the nest? So they won’t see people bringing food, or the people coming to Dollywood. They would associate people with food, become too acclimated to people, and not thrive in the wild. Where do the eaglets go when they are removed from the nest? They are taken to AEF’s hack tower overlooking Douglas lake. It is an artificial nesting site with 4 compartments. The siblings are kept together in a compartment, and have perching poles and plenty of room to grow strong. They are carefully monitored, but do not see the humans who are providing their food and water. When are the eaglets released? At about 13 weeks of age. How do the eaglets learn to fly or hunt? Flying is instinctive. Hunting is also an instinct, but it takes practice to become really good. Caregivers leave food for the eaglets along the lake shore in case they are unable to have success in hunting right away. If they are not with their parents, who teaches the eaglets to hunt? They are born with the instinct to hunt, but they also watch other eagles or hawks. Where do the fledglings travel when they fly free? They stay in the general area for a few days, then head north to Ohio and the Great Lakes. 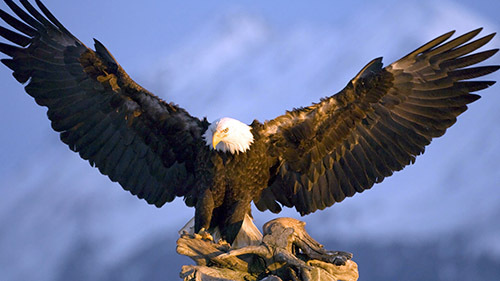 Do the eagles born in captivity ever come back to Tennessee to make their home? When they are sexually mature at around 4-5 years of age, they find a mate and then choose to either go to where the female first fledged, or where the male first fledged. Some of the eagles we have fledged have come back to Tennessee, built nests, and raised babies of their own! A perfect example of this is Lady Independence, who brought her mate, Sir Hatcher, back to an area close to where she first fledged. They have successfully raised several eaglets of their own.